Melt it down and make it weep. From its grip, I leap and surge. Watch the candle burn until white wax appears at the flame. Dissolve this depression, I beg of you. Into positive energy I can use at length. Lightly rub the stone against your temples and your heart, then place it in front of the candle and sprinkle it with lemon balm. Let the candle burn completely. Place the stone and herb in the cloth pouch and carry it with you. When your spirits need a lift, re-anoint the stone and repeat its empowerment chant. 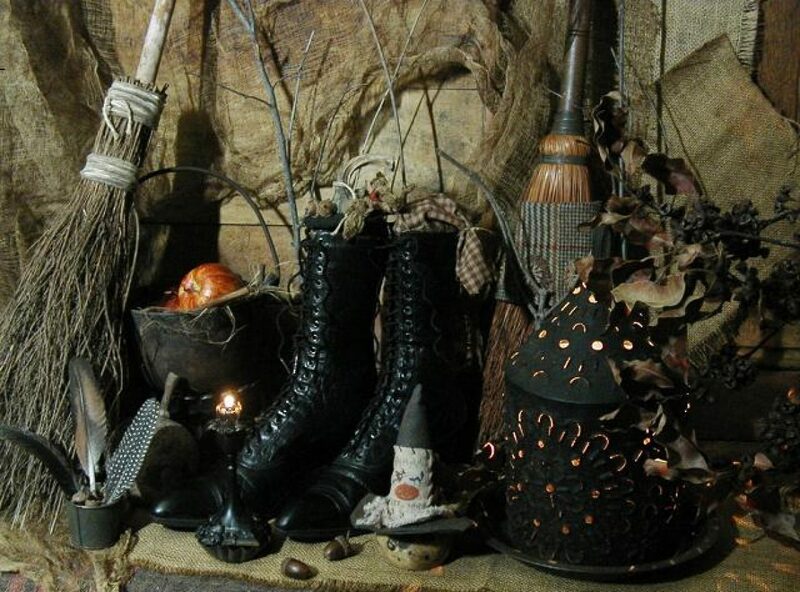 Posted on March 2, 2014 by ladyoftheabyssPosted in Articles, Daily Posts, Emotion Spells, New Beginnings SpellsTagged Candle, Crafts, Depression, Essential oil, Health, Lemon, Lemon Balm, Shopping, Soap and Candle Making, Supplies, Witches Spell. Taste and smell are closely linked, but they do have different aspects. Smell is very portable, something you can wear to continually remind yourself of your spellwork. Spells for courage, confidence, and other emotion-linked outcomes can be kept close, and when something is worn on your skin, it becomes a part of you. A vial of oil used as the focus for a calming spell can be a great way to get through a long flight, and the scents we use in our home can be integrated into protection and cleansing spells for when the place needs a quick touch-up. However, you can also use scents to evoke memory and, through that memory, the results you wish to attain. Drawing on memories of a loved ones, for example, can strengthen spells for that person, aid in contacting a loved one who has passed on, or help you access emotions tied to those memories. Emotions can be particularly hard to define in spellwork, but the way a result make us feel can be an important aspect of the working. In this way, finding the right scent to produce that emotion can make your goal more solid, bringing it just a little further into reality. Tomorrow, we examine “Taste” as it is used in spellworking. Posted on March 2, 2014 by ladyoftheabyssPosted in Articles, Daily Posts, SpellcraftingTagged Emotion, Health, Memory, Odor, Shopping, Smell and Taste, Spellwork, Tower of the Winds. A Little Secret That Only Witches Can Know About. Can I Trust You? Every secret organization or religion has a secret or two. Of course, you won’t never hear about them because they are secrets. Makes senses. Most of these organizations and religions have secrets to keep the public out and in the dark, to exclude them. On the other hand, our religion is not like that we have had to keep it secret just to keep it alive. If it was for our ancestors keeping our entire religion secret, we wouldn’t have a religion. The secret I am getting ready to share with you is not that big of deal. It was used in the Burning Times to determine if the person you were meeting was a witch. You can see during this period of time why it was very important to know who you were meeting. Here is the ritual. Enjoy! This is a magic witches hand shake spell. This spell is cast to find out if someone you know may or may not be a witch. After casting this magic spell, you will then shake the hand of the person you are inquiring about, and your answer will be revealed in the handshake. It can also be used to slightly put a thought or idea inside the mind of a person without coming right out and suggesting it. We offer many more free magic spells here for you to use and to try. really works and is cool, try it. Posted on March 2, 2014 by ladyoftheabyssPosted in Articles, Daily Posts, The WitchTagged Book of Shadows, Esoteric and Occult, Magic, Pagan, Religion, Religion and Spirituality, Shopping, Wicca, Witchcraft. Use Sundays for spells for new beginnings, for worldly success, to achieve ambitions and to reverse bad luck, especially and for health. Where possible, use an open space in sunlight for sun spells, such as a sunny beach or shimmering plain. Posted on March 2, 2014 by ladyoftheabyssPosted in Articles, Daily PostsTagged Ariel, Frankincense, Gold Incenses, Health, Michael (archangel), Michael Candle colour, Quartz, Religion and Spirituality, Shopping, Sun Archangel, Sunday, Thurible, worldly success. Altar: On a cloth of pale blue set a great bowl of salt water in which are set many shells and stones, a shell full of salt, incense, and the figures of sea-birds and fishes. Offerings: Wash something clean, or air it out. Daily Meal: Either fish or seafood, or poultry. Call: Now is the time of wind and water. Response: Now is the time of sea and sky. Call: Now is the time of the Gods of weather. Response: Now is the time of the great waves. Call: Now is the time of terrible flooding. Response: Now is the time of needed rain. Call: Now is the time of battering gales. Response: Now is the time of winds of change. Call: Now is the time of fear of change. Response: Now, and always, change will win. Call: The wild winds disturb our dreams. Response: The wild winds awake our minds. Call: The heavy rains flood our hearts. Response: The heavy rains water our future. Call: The sea will sweep us away. Response: The sea will bear us up. Call: The sea is cold and unending. Response: The sea is the source of life. Call: We are ships on the lost expanse of the ocean. Response: We are winds that call to one another. Call: We will brave the wind and water. Response: We will bring together mind and heart. Call: We will come home safely after wandering. Response: We will anchor safely after our journeys. Call: We will come through wind and water! Response: We will come through wind and water! Posted on February 27, 2014 by ladyoftheabyssPosted in Articles, Daily PostsTagged Blue, Business, Calendar of the Moon Ash Tree Month Color, Environment, Moon, Rain, salt water, Shopping, water, Wind, wind and water. Altar: On cloth of purple, grey, and silver place three lit grey candles scented with cypress, a branch of yew, a silver chalice of fruit juice, and a silver tray of frosted white cakes. Offerings: Food or other aid given to organizations that give aid to elders. Offer to spend time helping or keeping companionship with an elder. Daily Meal: Allow the three eldest members of the community to choose the meal. Into the sunset of life. Posted on February 27, 2014 by ladyoftheabyssPosted in Articles, Daily PostsTagged Accessories, Cake, Crone, Home and Garden, Moon, Saturn, Shopping, silver chalice, Wine. Altar: On a white cloth put a lit candle, incense, a cup of water, and a bowl of salt. Offering: Although this day is not a day of total silence, it is a solemn day and talking should be done only when necessary and in quiet tones. Bodies should be thoroughly cleaned during the bathing hour, and then the altar area should be cleaned and purified with all four elements. Each person, upon entering the altar space at the beginning of Sponde should remove their clothing and be naked, and each body should be purified with the four elements and marked with water and salt, at which point they may enrobe again. Chores of the day should concentrate on cleaning and repair. Daily Meal: Vegan and extremely simple and plain. Of anything but what should be there. Of anything that does not belong. And give it back again. Posted on February 21, 2014 by ladyoftheabyssPosted in Articles, Daily PostsTagged Altar (Bible), Business, Earth, Incense, Shopping, Southern Hemisphere, Sponde, Sun, Sun Feralia, water and salt. Posted on February 21, 2014 by ladyoftheabyssPosted in Articles, Daily PostsTagged Botanical garden, Esoteric and Occult, Friday, Gardens, Home, Pelargonium, Religion and Spirituality, Ruled by Venus Archangel, Shopping. What to do if you think you are being attacked. reflecting is the proper response. it out, you are protecting yourself, yet not being caught up in it. that they are “sending” so you may start a feud or cause unnecessary harm. Even if you are right, you are escalating a feud, of which we have too many. This is commonly discussed as a bad idea. 2 – Put up a reflective shield which will return the energy to the sender. energy than you can accurately reflect to the sender, if viewed properly. are going to have trouble reflecting it to an unknown person. attacking, they will likely already be prepared with their own mirrors, etc. mirrors to catch the intensified leak thru? already as to be sending without even realizing it). who advocate that may use terms implying “returning it with enthusiasm”. it. Grounding it does not. attempts at staying centered by claiming to do no more than is “justified”. Justified is not the question; self knowledge and balance are. one should know what they are stepping into. Posted on February 19, 2014 by ladyoftheabyssPosted in Articles, Daily Posts, Wicca, WitchcraftTagged Accessories, Barack Obama, Energy, God, Home and Garden, Mirror, Shopping, Ysios. This aspect needs to be lightened up a bit, things are getting to serious. Some humor or even a bit of flirting could lighten the tone greatly. The use of this, one of the most ancient charms, dates back to the commencement of our present civilization, and was in use previous to the Jewish dispensation. The symbol has been used in almost every religion, and was considered all powerful, efficient, and the perfect sign of the absolute. The triangle with the apex upwards symbolized all that was good and the inverted triangle all that was evil, and the two combined in the device portrays the triumph of good over evil. The seven discs represent the seven then known planets. This charm was worn to protect the wearer from every description of mischief and danger, and was a preserver from all evil. 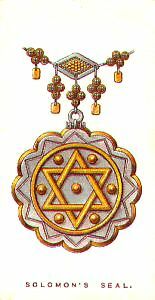 Posted on February 19, 2014 by ladyoftheabyssPosted in Articles, Daily PostsTagged ancient charms, God, Israelites, Jewelry, Religion and Spirituality, Seal of Solomon, Shopping, Solomon, Solomons Seal, Star of David.